Falcon College is one of the 9 000 schools world-wide offering the Cambridge International Examinations (CIE) curriculum. CIE is part of the Cambridge Assessment, a department of the University of Cambridge, well-known and trusted for excellence in education. CIE qualifications are internationally recognised. Every year thousands of learners use CIE qualifications to gain places at Universities around the world, to enter other tertiary institutions or to gain employment. CIE syllabi are reviewed and updated regularly so that they reflect the latest thinking of international experts and practitioners and take account of the different national contexts in which they are taught. Falcon College follows the complete Secondary curriculum starting at Secondary 1 level, followed by Secondary 2 and terminating with the Advanced Level curriculum. In the first two years of their secondary education students at Falcon College follow the Cambridge Secondary 1 academic curriculum. 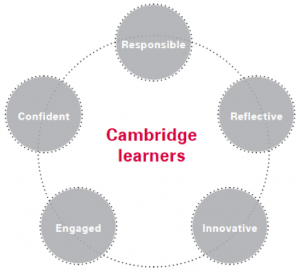 Cambridge provides the curriculum framework in the core subjects of English Language, Mathematics and Science. At the end of their Secondary 1 education students write the Checkpoint exams in these core subjects. Cambridge Secondary 1 Checkpoint is a diagnostic testing service that helps learners by giving comprehensive feedback on their strengths and weaknesses in each of these core subject areas. Checkpoint exams are set and marked by Cambridge. It is important to note that Checkpoint exams are not certification exams but are purely diagnostic. In addition to the core subjects of English Language, Mathematics and Science learners at the Secondary 1 level do French, Ndebele (a local language), Geography, History, Design & Technology, Art & Design, ICDL Computing, Music and Life Skills. Subject syllabi in these additional subjects have been revised and modified to adequately prepare students for the Cambridge International General Certificate of Secondary Education (IGCSE) qualifications – Secondary 2 level. For the subjects offered at IGCSE the Secondary 1 curriculum provides for a logical progression to IGCSE. 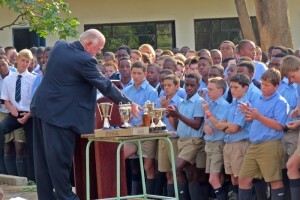 In their second and third years of secondary education learners follow the Secondary 2 curriculum. At this level learners study for the Cambridge International Certificate of Secondary Education (IGCSE) qualifications. More details about the curriculum structure offered at Falcon College at the IGCSE level at the IGCSE level are given in the downloadable document IGCSE PROSPECTUS 2016. At the end of their Secondary 2 education learners write the Cambridge IGCSE certification exams. In their final two years of secondary education Falcon students follow the Cambridge International Advanced Subsidiary (AS) and Advanced Level curriculum. At Falcon College we follow the staged assessment route to the full Advanced Level qualification. In their Lower Sixth year students follow the Advanced Subsidiary (AS) curriculum. The syllabus content for the Cambridge International AS level is half of a Cambridge International A Level programme in any subject offered at A level. At the end of their Lower Sixth form students write the AS certification exams. Students who have been successful at this level may carry their marks to A level where they will contribute 50% to the full A level qualification in any subject offered at Advanced Level. All students scoring B or better in a subject carry their marks to Advanced level. Those scoring grades lower than a B are normally required to re-write the AS components in a full complement of A levels. Mathematics is the only subject which may offer an option that has no carry-over from the AS components. Details of the curriculum structures offered at AS and levels are given in the downloadable document: AS & ADVANCED LEVEL PROSPECTUS 2016.